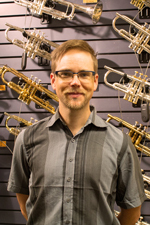 Bach Trumpet Artist, John Dover, based out of Portland, Oregon, fuses his classic sound with a modern edge. John’s influences range from the jazz sounds of Miles Davis and Chet Baker to the modern pop of Sting and Jamie Cullum. John takes the trumpet’s full spectrum of sound and delivers a contemporary approach to a romantic instrument. John also seeks to influence tomorrow’s generation by reaching out to the communities where he performs. Through private teaching and school clinics in addition to his performances and sessions, John gives these students the chance to interact with professional musicians – something that many of them have not had an opportunity to experience outside of their CD players. John Dover’s musical journey expresses a fusion of sounds for today’s listeners, from Jazz to Funk to Rock to Classical. John Dover and his trumpet,warming you up with his cool tone. If you have a question for John, or wish to contact him, please fill out the form below. The message will be passed along to the Education Center and they will get back to you.